I love the idea of using fresh flowers to adorn a wedding cake – especially in the middle of spring when everything is in bloom and so pretty! The best part about using fresh flowers is that you can pick and choose the perfect flowers to match your theme, colors, and personality. including peonies, garden roses, and bleeding hearts. It’s a perfect spring cake! 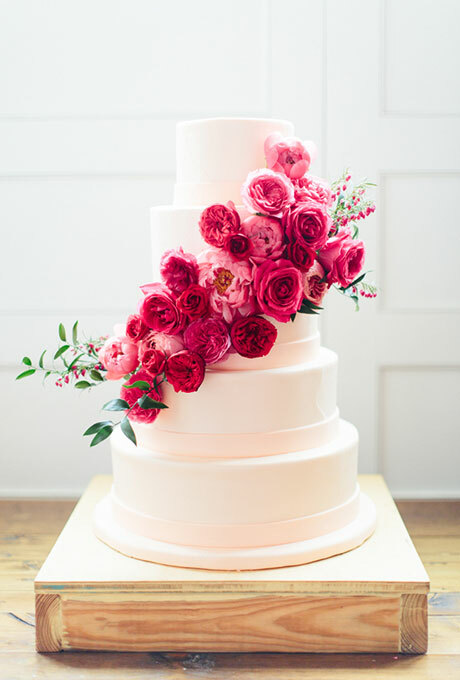 I love the cascade of blooms – it seems more elegant than placing a bunch of fresh flowers atop a cake. You can find this wedding cake here.